A surprising journey, from the first to the last step: starting with the captivating medieval town of Viterbo, which has an entire district dedicated to the pilgrims who, for centuries, have gathered on her streets, traveling along the ancient Etruscan roads, standing within the Roman amphitheatre of Sutri that was completely unearthed from volcanic ash, immersing yourself in the greenery of Mount Mario, Monte della Gioia, where you will, at last, take your first glimpse the dome of Saint Peter’s. You will have the hilly lush green scenery of the Lazio region as your traveling companion along the final section of the Via Francigena taking you from town to town. Feel youself gasp when you finally glimpse the dome of Saint Peter’s from the belvedere of Mount Mario. In Viterbo, the ancient seat of the Pontiff, you will be able to admire the loggia of the Popes, and meditate in the silence of the enchanting cloisters of Santa Maria Nuova, one of the oldest churches in the town. Have fun looking for the symbol of the Lion, the town emblem, on the buildings and drink a toast to the walk that is about to begin in the pilgrim’s quarter, enjoying the tasty local cuisine. Can’t you make up your mind? Try the acquacotta, the traditional dish of the Tuscia. The first leg of the journey will take you towards Vetralla, a village in the heart of the ancient Etruscan area. On your arrival, treat yourself to a snack of rustic bread and the local extra-virgin olive oil, before enjoying a walk through the alleyways of the old town centre. Continuing through the green countryside of Lazio you come to Sutri, a small town rich in attractions. The Roman amphitheatre, completely dug out from the tufo, is something not to be missed. Decide whether to sit on the terraces or to get up onto the stage, but as you leave remember to sign the visitors’ register: it is very important for the custodian, and if he is there he will invite you to do so. After this, proceed to the church of Santa Maria del Parto, the tufo walls of which are decorated in well preserved frescoes. Look for the group of pilgrims among the images, depicted in prayer with their sticks in their hand. From Sutri we go on towards Campagnano: during the journey you will flank the Mount Gelato Waterfalls, where you can stop for a reinvigorating bathe. A panoramic road of the Veio Nature Park will bring you to the gates of Campagnano. Here you can rest in the Venturi Park, the home of a three-hundred year old Yew tree the locals call the “Tree of Death”: but don’t worry, you can sit in its shade without any danger! If you feel like this stage may be too long, don't worry: you can make it shorter with brief stretches by public transport. From Campagnano you will continue through the Veio nature park with its woody hills, before entering the enchanting Valle del Sorbo. Along the way you will be able to admire the sanctuary of the Madonna del Sorbo, but also the old town centre of Formello, with its fine medieval buildings. Today your journey will end in the little village of Isola Farnese, clinging to a cliff surrounded by woods and dominated by the Castello Farnese: visits can be booked by internet and they offer a panoramic view of the surrounding valleys. So, you have reached the last leg of your journey which separates you from the Eternal City. Since this is a metropolis, there is, unfortunately, heavy traffic along the last section of the route: the belvedere di Monte Mario, from which you will finally be able to glimpse the dome of Saint Peter’s, however, makes the whole journey worthwhile and will soon make you forget the confusion of the big city. From here you will descend towards Piazza San Pietro, the arrival point of your journey and of the whole Northern Via Francigena. Do not forget to take a triumphant photograph in front of the Basilica, before celebrating the end of the journey, fortifying yourselves with spring lamb, pecorino romano cheese, and perhaps a delicious maritozzo with cream...you have deserved it! Last day included. Service ends after breakfast. Hotel Riario is located in the center of Medieval Viterbo, in a builiding of the 16th century. Rooms are furnish in elegant way, comfortable and well-finished. These offer TV, free Wi-Fi, air conditioning. Breakfast is good and rich. This hotel is a family business in the small town of Vetralla, 12 km south of Viterbo and it's suggests to those who have no many demands. Rooms are basic and simple with private bathroom, TV, free Wifi, air conditioning, but not well soundproofed. Staff is not very much present and breakfast is normal. The Antica Locanda *** is immersed in the Tuscia Viterbese countryside, surrounded by expanses of olive groves. It offers well-kept, clean and rustic-style rooms. Comfort: free WiFi with uneven coverage in all rooms, air conditioning, TV, telephone. It also has mini-apartments equipped with a kitchenette and whirlpool. Very good breakfast with genuine products and quality. This B&B is located in Sutri a few steps away from amphitheatre and necropolis. Rooms are confortable, welcoming and clean. These are equipped with TV, free Wifi and electrical kettle. On site you can use a common kitchen area. Owners are friendly and helpful. Breakfast is rich and various of sweet and savory dishes. The Montefosco Farmhouse is immersed in the green of the Lazio countryside, surrounded by an expanse of hazels. The rooms are well kept, clean and well furnished, equipped with every comfort: free WiFi, TV, air conditioning / heating. The cuisine is of quality and the restaurant offers traditional products prepared with local ingredients. Friendly and helpful staff. Hotel Ristorante Benigni is located in central Campagnano Di Roma surrounded by Veio's Park and by volcanic complex of Monti Sabatini. Rooms are simple and basic with private bathroom, air conditioning, TV, telephone and free Wifi. Restaurant is very esteemed. Average breakfast. This Hotel is sets in the medieval village of Isola Farnese and it has a quiet and relaxing location. Rooms are furnish in a simple way, but these are spacious and comfortable with free Wifi, air conditioning. Staff is welcoming and helpful. Breakfast is normal. The rooms of Domus Sessoriana are obtained from the cells of the monastery attached to the Basilica of the Holy Cross in Jerusalem. These are spacious, basic and clean. They have these comfort: air conditioning, satellite TV and free WiFi in common areas. Staff is courteous and helpful. Italian breakfast is served on the terrace. Selene Style Hotel, located in the center of Rome, is very close to the main attractions and it is also close to the metro. Rooms are all recently renovated and are modern and beautifully decorated. These are equipped with free Wifi, soundproofing, air conditioning, TV, minibar, coffee/tea maker, telephone with direct line. Breakfast is rich and good. From any of the airports indicated (PEG, FLR, CIA, FCO), you can reach the central train station by public transport, and then take a train to Viterbo. Trains are direct from Rome, whereas you need to change either once or twice if you are travelling from Perugia or Florence. From Rome, you can reach the main airports by either bus or train. Check train timetables on www.trenitalia.com. GPS tracks are available on request. When you start the tour in Amsterdam, Bruges, Utrecht, Bunnik and Huizen it is possible to rent a GPS device (€ 10 each). · lunches and dinners, if not otherwise stated. · everything that is not mentioned in the "What is included" section. · Transfers to reach the starting location or to leave the arriving location of the tour, which will be quoted on request. 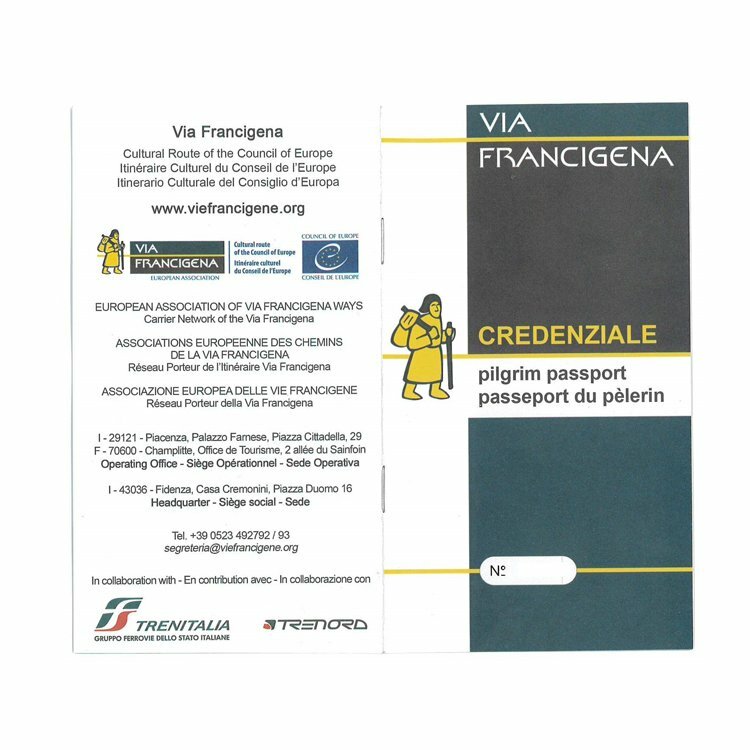 The Credential Kit and Official Guide in Italian: two basic objects for walkers along the Via Francigena. 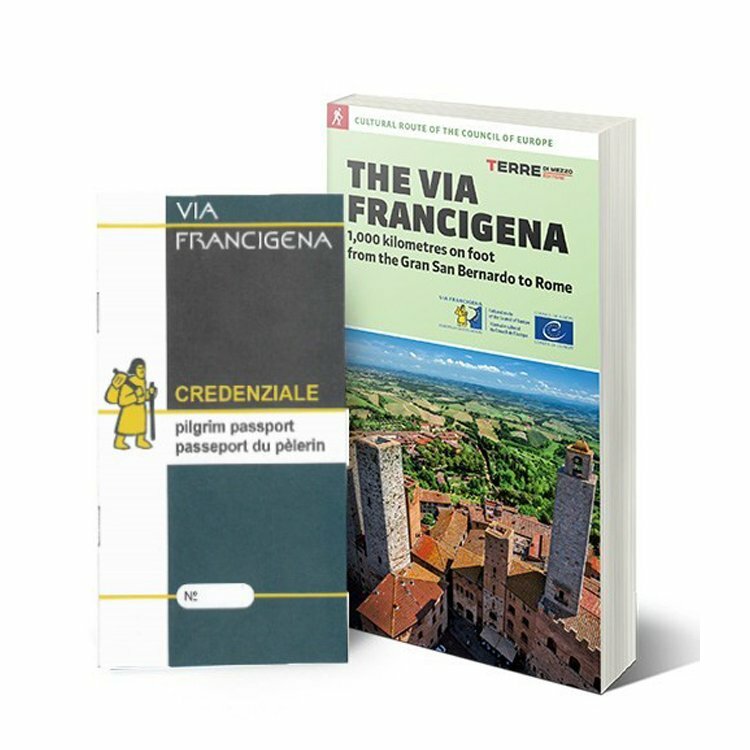 Inside the Credential Kit and Official Guide in Italian you will find the official guide of the Via Francigena. Discover detailed maps, altimeters, step by step description of the route, official variations, where to sleep and places to visit. By delivering the credential in every place where the pilgrim is hosted, you will receive a stamp, useful for completing the journey and necessary to request the "Testimonium" (you must have covered at least the last 200km by bike or 100km by foot). The pilgrim's credential is the fundamental document for the pilgrim. It is necessary to have the credential to have access to the reception facilities located along the itinerary. Furthermore, it allows you to take advantage of agreements with restaurant activities. In some regions, public transport services are also contracted. Do not miss ideas on trips to discover and enjoy.